The Zomo Deck Stands are a clever solution for your DJ setup at home or in your club or bar. Stylish and practical they are constantly being revised to take into account the ever changing requirements of the digital DJ. controllers, effects and samplers etc. Please contact for pricing and shipping costs. 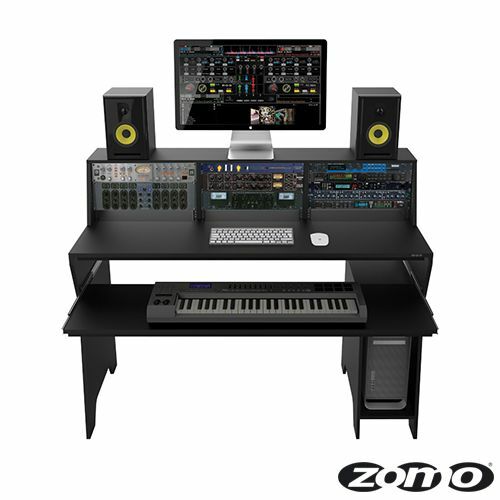 The Zomo Ibiza Deck-Stand 120 is a clever solution for your DJ-setup at home and for your professional club performance. The Zomo DJ-Deck offers enough space for 2 turntables or cd-player and a mixer up to 12". There is also enough space for several 19 zoll instruments like an amplifier or an 19 zoll cd-player in the second stock. 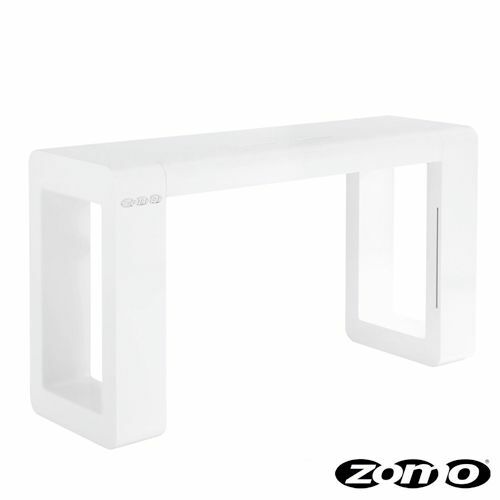 The Zomo Deck Stand Ibiza is an eyecatcher with his high class surface. Please contact for pricing and shipping costs! 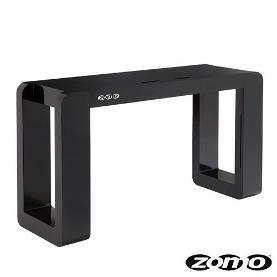 The Zomo Ibiza Deck-Stand 150 is a clever solution for your DJ-setup at home and for your professional club performance. The DJ-Deck offers enough space for 2 turntables or CD-Player and a mixer up to 19". Their is also enough space for several 19 zoll instruments like an amplifier or an 19 zoll cd-player in the second stock. TheZomo Deck Stand Ibiza is an eyecatcher with his high class surface. Due to the ever changing requirements of the digital DJ, the Berlin and the Miami's work surface has been extended by 3cm to create even more space for DJ controllers and laptops / MacBooks. 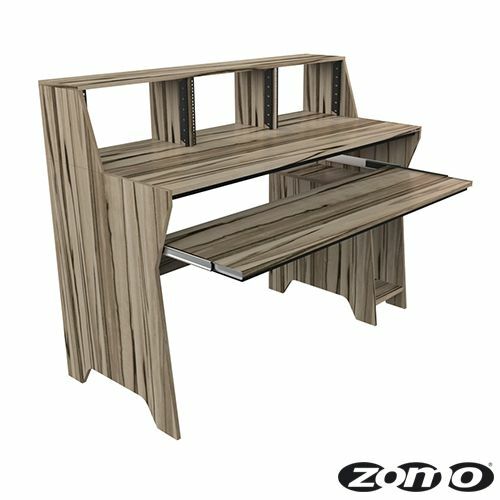 The Zomo design engineers have also improved many other details of the Deck Stand and taken Zomo’s high standard of quality to another level. 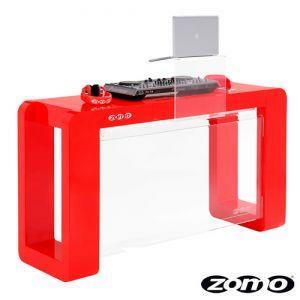 Many leading DJ’s were consulted to realise the unique features of this Deck Stand to deliver optimized perfection. This latest versions of the Zomo Berlin and the Zomo Miami Deck Stands is based on a modular system. This means that the basic Berlin MK2 model can now be offered at an amazingly affordable price. It can be ordered separately or with any of the accessories needed to expand the setup. As a strictly limited edition, Zomo are pleased to offer a special Berlin MK2 LTD and the Miami MK2 LTD deck stands, complete with all accessories! The Zomo Berlin MK2 and the Zomo Miami MK2 Deck Stand will be restricted to just 10 pieces per color worldwide so will become very rare and collectable. The LTD models are equipped with everything you need in a Deck Stand – a full compliment of AC outlets, high quality audio wiring, a laptop stand, acrylic front panel and LED lighting! The Berlin’s gloss paint finish is comparable to the high quality finish used in the automotive industry and it is extremely robust and easy to maintain. Minor scratches can be easily removed by any conventional polish. Of course, this version also has the obligatory cable management and the extremely fast-action snap closures, which ensure a quick and easy assembly/ disassembly every time. The Zomo Berlin MK2 LTD and the Zomo Miami MK2 LTD Deck Stands are a unique product for DJ’s looking to stand out from the crowd and deliver really special performances. • PowerKit 1: This smart and easy-to-install electronic kit conveniently adds a set of power sockets (2 pin ‘Euro’ style AC connectors) and high quality audio wiring to the Miami or Berlin Deck Stand. • PowerKit 2: This smart and easy-to-install electronic kit conveniently adds a set of power sockets (International version with multi-fit style AC connectors) and high quality audio wiring to the Miami or Berlin Deck Stand. 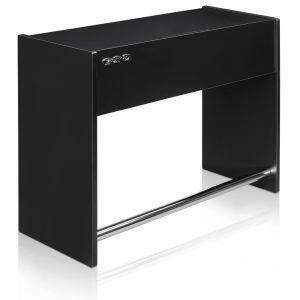 • Acrylic Front: The sturdy acrylic panel gives the Miami or Berlin Deck Stand a massive ‘wow’ factor. You can personalise the panel to really enhance your set, especially when used with the optional LED lighting kit. 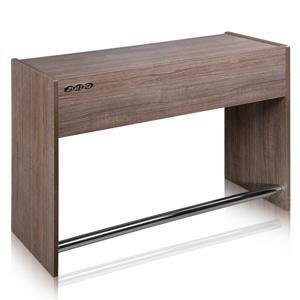 Also, the panel protects your setup and connections from unauthorised access whilst adding extra stability. The acrylic glass can be fitted quickly and easily and is a real highlight for your exclusive Miami or Berlin MK2 Deck Stand. • LED: The LED panel has been specially designed to integrate with the acrylic front panel and can be easily fitted. This gives the Deck Stand a really cool illumination effect to catch the eye and draw attention to the performer. • Acrylic Laptop Tray: The optional acrylic laptop stand can be mounted in three different positions and will accommodate any standard laptop or any current MacBook. The laptop stand is very stable, easy to install and totally versatile. 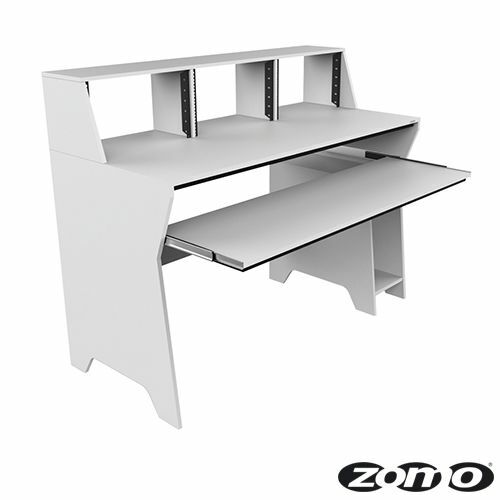 The available working area is 40 cm x 29 cm. 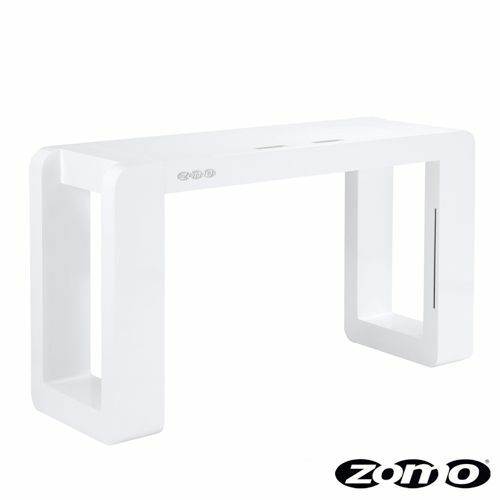 • Acrylic Front: The sturdy acrylic panel gives the Miami or Berlin Deck Stand a massive ‘wow’ factor. You can personalize the panel to really enhance your set, especially when used with the optional LED lighting kit. 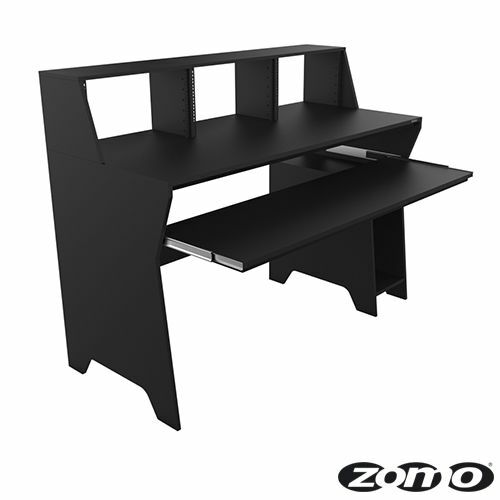 Also, the panel protects your setup and connections from unauthorized access whilst adding extra stability. The acrylic glass can be fitted quickly and easily and is a real highlight for your exclusive Miami or Berlin MK2 Deck Stand. • Acrylic Laptop Tray: The optional acrylic laptop stand can be mounted in three different positions and will accommodate any standard laptop or any current MacBook. The available working area is 40 cm x 29 cm.